The future or a gimmick? Fabric has reinvented the water bottle holder, replacing the traditional cage concept with two round studs and a special, slotted water bottle. The cynical side of me instantly thought Fabric has just come up with a solution to a problem that doesn’t exist, but on reflection this clever concept is more than a gimmick. 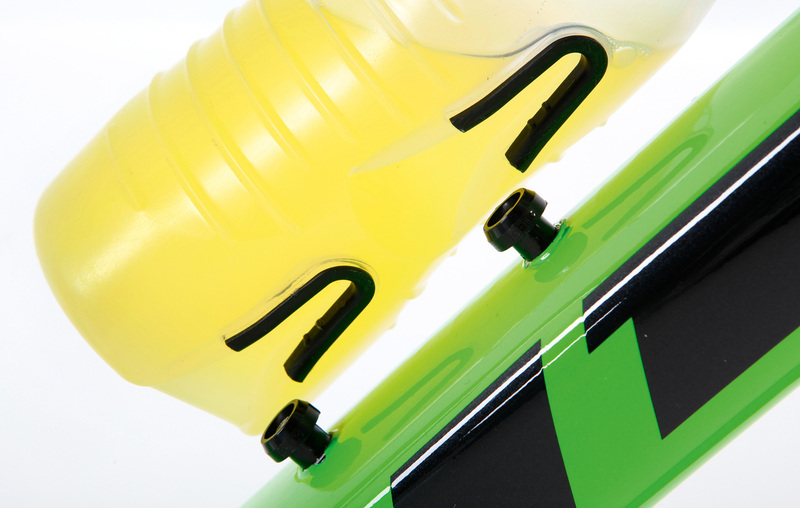 The bottle works by slotting onto little round studs that are threaded into your bike’s standard bottle cage bosses. There are two v-shaped slots in the underside of the bottle that help the docking process while you’re riding, and although it takes a little practice to get the knack, once in place the bottle is held very securely, even on really rough trails and over jumps. At a tenner for a system this light (a carbon cage costs at least £35 and still weighs 20g) it’s really good value too. The bottle doesn’t have to be round either, meaning it fits better in your hand — something that also helps you line it up with the studs. Without a bottle, your bike retains its clean lines too.